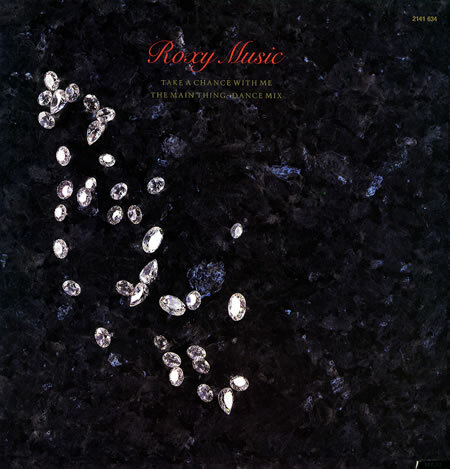 We’ve already had one Roxy Music song on here from the very beginning of their career (Virginia Plain). Now here’s another, right from the every end of their career. In fact these two songs act as bookends (their first and last singles) for a remarkable band who underwent a significant musical transformation in their career. At first listen, it’s sometimes difficult to believe that these are the same bands. 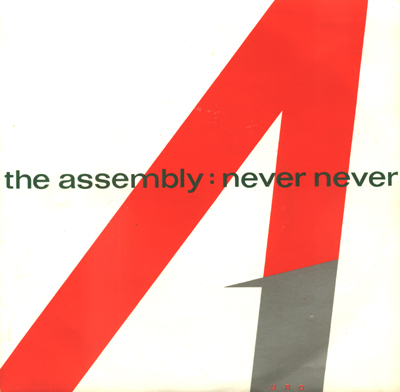 Starting off as a unique combination of avant-garde and retro-pop, Roxy gradually acquired mainstream success and acceptance in the mid-1970s with songs like Love is the Drug, before re-emerging at the end of the decade after a brief hiatus with a smoother, more sophisticated sound, something that reached its peak/nadir (dependent on your point of view) in the commercially and critically successful final album Avalon. I’m firmly in the camp that believes that loves the latter-day Roxy – sure, it is different to what they started out as, but Avalon in particular is just a gorgeous album, rich and romantic songs cloaked in beautifully sculptured soundscapes. Buried away in the middle of side 2 (in old money) is this, their final single. It wasn’t particularly successful in commercial terms (peaking at 26 in the UK singles chart) but it does showcase the whole vibe of Avalon, one of those albums best consumed as a whole, with a consistent dreamy sound and style all of its own. I’d never have really considered this as a song for ukulele (that sophisticated sound is not something that you regularly associated with the humble uke) but hearing it the other day it struck me that underneath that lush production is a simple and effective song. And I do believe that is the case. There’s nothing very difficult here. I’ve ignored the long intro of the original, although I have tried to tab something that vaguely resembles the guitar riff at the beginning and after the choruses – you can choose to ignore that if you wish. And there’s a G to G/F# run down after each line of the chorus that you can also choose to ignore. Whatever you do, though, enjoy! Categories: Pop, Rock | Tags: 1980s, 1982, Rock, Roxy Music, ukulele | Permalink. Ezra Furman only popped onto my radar back in July. Ezra was playing at The Joiners, a local venue, the following week, and a friend has posted a YouTube clip on Facebook to highlight this. I took a listen, liked what I heard, explored a bit more and thought that this sounded like an interesting proposition. So booked tickets for myself and my daughter. The following day it happened to be my birthday, and as a result of mentioning the gig to said daughter she ended up buying me a copy of Furman’s 2013 album Day Of The Dog. It’s that album that My Zero is taken from. Furman is a hard act to categorise. There’s definitely a punk attitude behind the music that he makes. There are strains of rockabilly in there, touches of do-wop. He seems to be a relatively shy individual, but his performances and songs are in-your-face, heart-on-the-sleeve, visceral, dwelling on his Jewish roots and his mental health challenges amongst other things. Oh, and he can often be found – on stage and off – in a dress and make-up. But there’s no doubting the man’s commitment. He’s certainly not blessed with the prettiest of voices, but more than makes up for it with edge and attitude, songs that are real punch of rawness, energy and emotion. Yet for all that these are songs with melody at their heart. He’s unlikely to be a major star, but who cares. This is a man who clearly has to make music, and has to make music like this. The world is a better place for that. And so to the song sheet. The song is basically just a constant repeat of four chords. And they’re not difficult chords (I’ve transposed it down a semitone from the original, which is in G#). I’ve also added in a couple of riffs as well which play over the top of the instrumentals – the first performed on guitar on the original, the second by keyboards. There’s a distinctive strumming pattern which you hear on the intro to the original, that isn’t too hard to replicate – it goes something like duXuduXu, where X is a damping the strings, but probably best just to listen to it to get the feel. 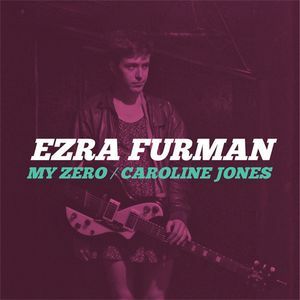 Categories: New Wave, Rock | Tags: 2000s, 2013, Ezra Furman, New Wave, Rock, ukulele | Permalink. Songs don’t come more classic than this. If you judge the quality of a song by the number of times its been covered (and by the diversity of those covers) then this has to be up there with the best of them. 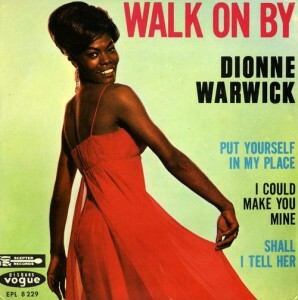 Variously covered by as eclectic a collection as Isaac Hayes, The Stranglers, Average White Band and Diana Krall, it is still the peerless original version by Dionne Warwick that stands over them all. Warwick had a particularly strong relationship with the Bacharach and David songwriting team, much of whose work was written for her. Over a 20-year period Warwick charted 38 singles co-written or produced by Bacharach and David, including Don’t Make Me Over, Anyone Who Had A Heart, Alfie, I Say A Little Prayer, Do You Know The Way To San Jose, and many, many more. It’s hard, if not impossible, to pull any one song out from that list, but if there was one song that exemplifies that relationship, Walk On By has to be a strong contender. So here’s the song sheet. As with many Bacharach / David songs, this is never as straightforward as it might at first appear. In this case, the rhythm and timing is what tends to require a bit of focus / attention (if my experience is anything to go by). Your best bet will tend to be listening to the original, and getting the feel from that. Of course, if you want a punk feel (The Stranglers) or a funky/disco feel (Average White Band) listen to those versions as well. Categories: Pop, Soul | Tags: 1960s, 1964, Burt Bacharach, Dionne Warwick, Pop, Soul, ukulele | Permalink.